QBioscan has been created to enable a precise evaluation of sweat gland function. It is based on a measuring method, whereas patients place their hands and feet on stainless-steel electrodes and are exposed to an incremental low direct voltage - lower than 4 V - that is released in intervals of two minutes. What is being tested is the electrochemical reaction between electrodes and chloride of the, through low voltage stimulated sweat glands. This active, new method provides information and evidence of a sweat dysfunction that might otherwise not be detectable in physiological conditions. Bioelectrical Conductances (BEC, in microsiemens, uS) for the hands and feet, express the quantitative results, while a risk score is derived from demographic data and the BEC values. 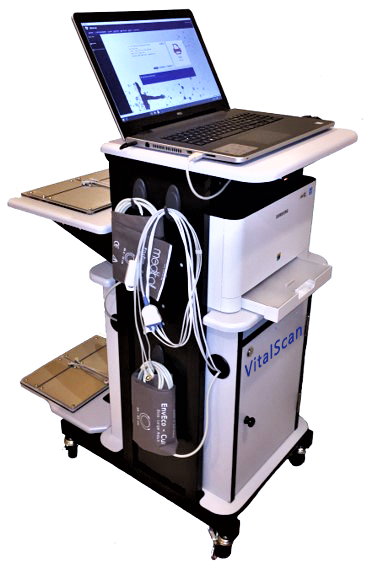 The QBioscan system, in accordance with the 21 CFR 882.1540, represents a galvanic Skin response device that provides skin conductance measurements on a computer screen. QBioscan is, similar to a galvanic skin response stress test, an active test that measures the sweat glands' capacity to release chloride ions following an electrochemical stimulation. It works by measuring the electrical potential difference caused by the electrochemical reaction of electrodes, which are applied to the skin and are stimulated by a low voltage of variable amplitude. QBioscan comes with 5 independent electrodes for placement on the body, for example feet or palms and other areas with a high number of sweat glands. QBioscan provides information that determines the cardiometabolic risk in patients. The test, equivalent to a galvanic skin response stress test, measures the sweat glands' capacity to release chloride ions in response to an electrochemical activation. The advantages: QBioscan does not require any patient preparation, such as blood drawing or fasting; it is non-invasive and delivers immediate results, with findings that are ready to use after a short and uncomplicated test of merely 2 minutes. QBioscan has been developed for use by general practitioners, pharmacists, cardiologists and neurologists to assist in the effective screening of cardiometabolic risk in patients. *	Sudomotor dysfunction has been established as one of the earliest detectable neurophysiologic abnormalities in distal small fiber neuropathies. *	As an index of the severity and distribution of automatic failure, quantitative assessment of sweat response has been proposed. It will also serve as an early indicator for regeneration of small fibers. *	QBioscan measures bio electrochemical sweat skin conductances (BEC), which are directly connected to the capability of the glands to transfer chloride ions and which reflects small-C fiber status. *	QBioscan is a fast and easy method to measure sweat function. *	Analyze and test QBioscan's responsiveness and accuracy in detecting diabetic neuropathy and compare it with existing standardized tests for the diagnosis of diabetic neuropathy. *	Evaluate QBioscan in patients with Diabetes Mellitusm, as an instrument to assess autonomic neuropathy and neuropathic pain. *	QBioscan is an innovative, sensitive tool for the detection of diabetic neuropathy, especially painful diabetic neuropathy. As sweat glands are innervated by small c fibers, which are also involved in pain pathways, precise measuring of the sweat gland function can identify that cause. *	QBioscan, a sensitive device to detect neuropathy in patients with diabetes mellitus, operates with a sensitivity of 80% and a specificity of 95%. *	When compared to non-painful neuropathy, feet BEC was significantly decreased in patients with painful diabetic neuropathy. *	These results suggest that the peripheral autonomic nervous system plays a role in painful diabetic neuropathy. *	QBioscan results correlated significantly with clinical neuropathy scores, pain scores and measures of autonomic dysfunction. The study of sudomotor presents a useful tool to assess autonomic disorders, as Sudomotor function is known to reflect sympathetic activity and to provide insight into postganglionic autonomous innervation. Recent clinical studies have shown that conventional tests were influenced by level of glycemia. QBioscan however has proven to be a reproducible and quantitative test method, which is not affected by that, and QBioscan's Bio Electrochemical Sweat Conductance (BEC) reflects sympathetic dependent sweat function. Sudomotor function assessment can now be carried out faster and simpler with the new Medeia technology. In response to electrochemical activation, it measures the ability of sweat glands to release chloride ions and detects abnormalities. Once suspected or confirmed, more specialized tests are recommended to diagnose the underlying cause of the irregularity. One of the major causes of nerve damage is diabetes. As diabetes patients suffer from metabolic impairment and related inflammatory processes, their non-myelinated axons of small fiber nerves are primarily affected, and known as Diabetic Autonomic Neuropathy (DAN), a subtype of peripheral neuropathies. To test Medeia's new technology for DAN detection, there are presently several clinical studies ongoing. While symptoms remain sub-clinical, diabetes is known to affect the peripheral nervous system and small nerve fibers are usually among the first victims. QBioscan has been developed as a new device to follow-up on complications related to diabetes. Left side - Normal innervation of a sweat gland at the distal leg in a healthy person. Right side - Reduced innervation of a sweat gland in a diabetic patient. The most prevalent complication of type-2 diabetes is Peripheral neuropathy. Cardiovascular Autonomic Neuropathy (CAN) has proven to be the highest risk factor for silent ischemia in patients with diabetes, and yet, in the field of neuropathy, it is probably still the most overlooked area. A non-biased and non-invasive way to assess sympathetic and parasympathetic modulation of the heart rate is HRV or Heart Rate Variability. It has largely been agreed upon that the parasympathetic system controls the High Frequency (HF) component, while the sympathetic system modulates the Low Frequency (LF) component. The accuracy of HRV analysis could be increased by exercise, as a joint consensus statement of the American Academy of Neurology the American Diabetes Association (ADA) confirms. Both bodies recommended that, to asses CAN, a series of Cardiovascular Autonomic Reflex Tests (CARTs) should be performed in assessing HRV during standing or deep breathing while monitoring postural systolic blood pressure fall, a method that is commonly referred to as the Ewing tests. Sweat glands are stimulated by thin and non-myelinated sympathetic C-fibers that, depending on their lengths, can be damaged by peripheral neuropathy. With the understanding that functional disorder of sudomotor has been confirmed in pre-diabetes and diabetes, the ADA suggests in a consensus explanation that sudomotor function should be part of the diagnostic test for the early detection of neuropathies in diabetes patients. Despite the fact that a number of different methods have been developed, the lack of quick, easy-to-use tests for the diagnosis of sudomotor dysfunction has hindered its use in clinical practice in a broader format. With QBioscan, a new device for quantitative assessment of sudomotor function has been developed. It is non-invasive, produces quick results and is even a useful tool to screen sympathetic system dysfunction in patients with Impaired Glucose Tolerance (IGT) or diabetes, as a number of studies have shown. To diagnose Cystic fibrosis (CF), a sweat test is needed to show increased chloride concentration. Since these time-consuming and skill-demanding sweat tests are only used for selected patients, new technologies are needed, that shorten this process and easily and very quickly show abnormal sweat chloride concentrations. The new, patented technology of QBioscan has been designed with these benefits in mind. It increases low direct current voltages (<4V) generating reverse iontophoresis, and allows the measurement of BEC (bio electrochemical skin conductance), which is linked to chloride - the ion with the highest physiological concentration in sweat. Small nerve fibers are the very first victims of diabetes, which is known to affect the peripheral nervous system even symptoms remain sub-clinical. According to a recent study, already at an early stage of the diabetes evolution, the sympathetic innervation of eccrine sweat glands is progressively reduced. Irrespective of temperature and physical exercise, this alteration of the sweat glands' autonomous control causes a long-lasting shift in the ionic balance of sweat conducts. To detect ions, they have to be transported from the inside to the outside through the skin membrane. This process is called reverse iontophoresis. It entails an application of electrodes with a low voltage potential of variable amplitude to the skin, and observes the electrical potential difference caused by the electrochemical reaction on these electrodes. The QBioscan device has 6 independent nickel electrodes that are placed on skin regions with a high density of sweat glands (palms, feet, forefront), and the data gathered provides a score that represents the individual's risk for show pre-diabetes (IGT), diabetes and complications. The system is automatically calibrated by a multiple electrode array, and after about two minutes of data collection, the results are displayed on a screen in graphical format. In order to define the point of onset in regards to responses measured upon the use of low voltage potential with variable amplitudes to Ni electrodes, a study of the electrochemical behavior of nickel, in a set-up similar to that of the medical device, was carried out. The trial provided evidence, which clearly indicated that the main sweat parameter controlling the electrochemical currents is a result of the variation of chloride concentration. In-vitro study and clinical observations were compared and evidently demonstrated the closeness of electrochemical in-vitro measurements on the behavior of nickel electrodes to those obtained through the clinical tests. It was further discovered that the determination of the current curve as a function of the potential (anode, cathode or their difference) supports a very efficient way to detect the deviation in Cl- concentration, at the level of the electrodes. Medeia also analyzed the influence of chloride concentrations on the kinetics of the electrochemical reactions and to furnish a theoretical model, the proposed mechanisms and the obtained kinetic parameters were then used. In this context, it could certainly be of interest to compare the electrochemical behavior and surface modification between electrodes aged in-vivo and electrodes aged in-vitro, as well as analyzing the electrochemical behavior of different compositions of stainless steel. Another interesting aspect could be the study of anodic reactions and their electrochemical kinetics when placed in physiological solutions at the surface of stainless steel electrodes.